What Items Can’t Be Secured to a Roof Rack? 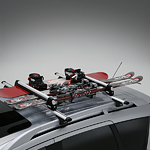 | Grand Prix Motors Inc.
What Items Can’t Be Secured to a Roof Rack? As a driver, you are responsible for any objects that are secured to the top of your vehicle. That is one of the reasons why you need to spend some time familiarizing yourself with a few common items that should never be strapped to a roof rack. Clothing, tarps, tents, and other flimsy items must never be secured to a roof rack unless they are inside sturdy containers. Storage boxes are relatively inexpensive, and they are very easy to secure as long as you have a good set of straps. You should also be wary of storing any foods or beverages on the roof rack unless they are in insulated containers. If you're ready to upgrade your vehicle to one with a durable roof rack, stop by Grand Prix Motors Inc. to browse our new-to-you models.